The DI Accessories Foam Lance will allow you to spray a layer of foamy shampoo on your vehicle's exterior when attached to your pressure washer! Just pour any shampoo in the reservoir, connect to a pressure washer and start spraying foam on the exterior. The light and fluffy shampoo mix will produce a thick coating of foam that stays on the exterior and doesn't run off. The shampoo will instantly create a slick surface that starts to break down contaminants and loosen them for safe removal with your wash mitt. This means your washing process is safer and more effective! It's an incredibly durable unit made by MTM Hydro which is an industry leader. 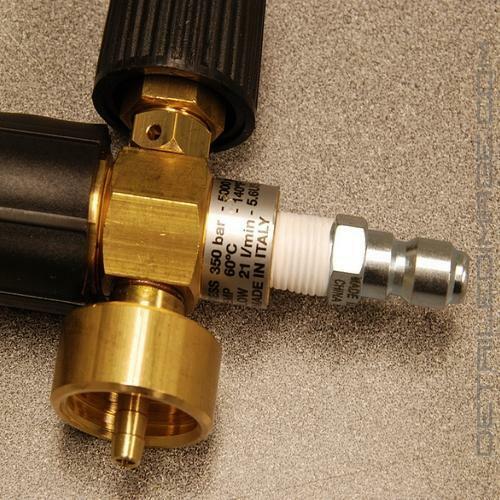 This Foam Lance features an adjustable intake, so you can increase or decrease the amount of foam created. Another great feature is the various spray patterns available to meet your needs, with a simple twist of the nozzle you can go from a 0 degree jet to 50 degree fan pattern. You can use this Foam Lance with virtually any pressure washer that is between 700 to 3000 PSI. Therefore if you own a pressure washer and want to clean your vehicle look no further then the DI Accessories Foam Lance! 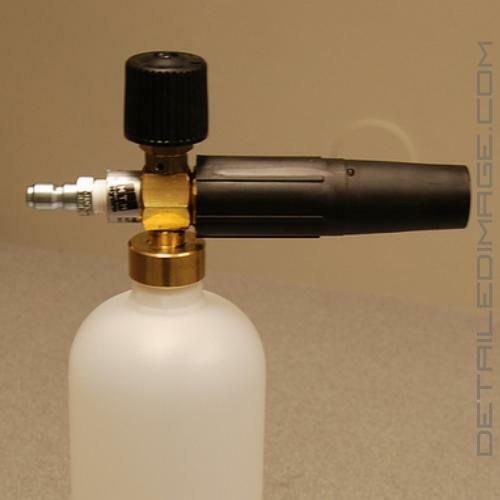 Note: The Foam Lance, DI Accessories Featherweight Foam Cannon, and DI Accessories Foam Cannon are designed to work with the majority of pressure washers, including Karcher units. If you have a Karcher you may need to pick up the DI Accessories Karcher K Series Foam Lance Fitting for a seamless fit. If you do not have a Karcher pressure washer, the DI Accessories Speedy Super Foamer is also a great choice! 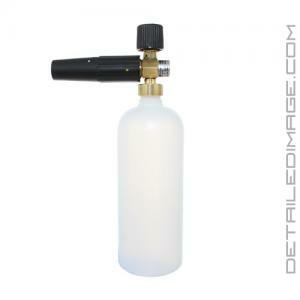 Are you looking to spray foam vertically AND horizontally with one unit? If so, pick up the DI Accessories Foam Cannon! No Pressure Washer? If you do not have a pressure washer, we recommend using the Gilmour Foamaster II Foam Gun. This unit will not produce as thick of a layer of suds as the Foam Lance or Foam Lance II, but it will work with any standard garden hose. Warning: This product can expose you to chemicals which are known to the state of California to cause cancer or birth defects or other reproductive harm, go to www.p65Warnings.ca.gov for more information. The products we sell are not intended for use in potable water systems and are only for industrial non-drinking water applications. I find the DI Foam Lance to be a very useful tool when my vehicle is particularly dirty or when I need to strip any remaining wax or sealant from the vehicle with Chemical Guys Citrus Wash Shampoo. It is a quick and easy way to apply a nice layer of foam to your vehicle to remove dirt and contaminates before you begin your normal wash process. Hopefully this has inspired you to pickup a foam lance for yourself! You'll enjoy using it, and you're sure to get some attention from the neighbors! Very effective tool! Saves a lot of time and washing! I use with citrus wash and hardly even have to use the microfiber mitt! This is a simple to use yet effective tool. Helps with the initial pre-soak to break up heavy dirt and grime. Yes these may seem like overkill for the average consumer, but a must have for professionals. I purchased the Detailed Image MTM Hydo Foam Lance along with Maxi Suds II for the sole purpose of spraying the car with foam using my CleanForce medium-duty electric pressure washer. This is a high-quality product that works as expected when used with the right type of soap. At first, I used the Meguiars NXT car wash (about 3 oz) that was sitting on my shelf with this foam lance. This is a great soap when used in a bucket method, but it hardly created any suds through the foam lance. 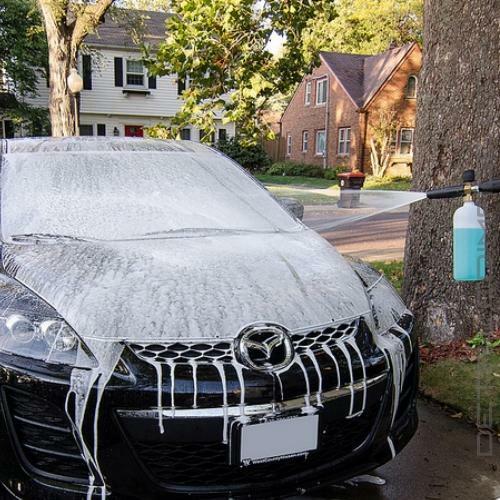 However, when I used Maxi Suds II (about 2.5 oz) with the same foam lance, it created very good foaming that stayed on the car for a few minutes. The difference in foaming was day and night. I only wish the soap/water container had oz. markings to make the dilution a bit easier. Otherwise, it is a great product.